Let's face it! We all love to pig out and overindulge every now and then. Heck! Some of us treat every day like it's a cheat day. So it's no surprise when we wind up with some unwanted junk in the trunk! But did you know that animals sometimes like to follow in our footsteps and pig out a little? Yup! They're so similar to us in every other way, that it should come as no surprise to find out that these furry little creatures sometimes can't say "no" to food either. Take a look at these hilarious animals who simply couldn't help but chow down like there's no tomorrow. #1. You know that moment when you're so hungry in between breakfast and lunch that you'd chow down anything you can find? Because some days, you simply need second and third breakfast, am I right? #2. 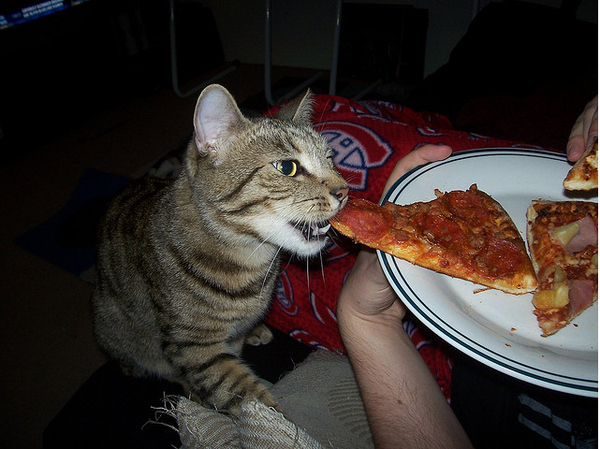 This lucky cat is having pepperoni pizza for dinner. Once she has delicious pizza, it will be hard to go back to dry boring kibble. #3. We would have the same expression if we had a funnel cake sitting in front of us. Seriously, have you ever seen a dog smile that big? He looks so grateful. #4. This little piggy looks like he's experiencing chocolate nirvana. It doesn't get any better than chocolate cake with frosting. Yum! #5. There are some folks who claim avocado isn't all that, but thankfully, avocado detractors are slim to none. Even animals have a hard time resisting Mother Nature's creamy treat!